Three Penn State Berks students received awards in the fourth annual Spanish poetry-writing contest sponsored by the Latin American Cultural Center of Lancaster (LACC). Students from Lancaster, Reading, and Harrisburg in grades 6-8, 9-12, and university undergraduates wrote original poems in Spanish. 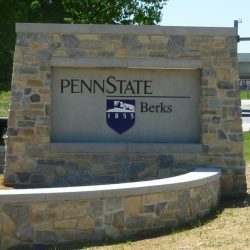 Penn State Berks captured the top three prizes in the university category. The university winners all study Spanish at Penn State Berks. They include senior Karissa Smith, who won first place with El Amor Es Más Fuerte Que la Sangre; senior David Lee, who came in second with Mamá; and first-year student Thalia Castaneda, who placed third with Eres Una Reina. The first place poem in each category will be published in La Voz Latina and Palo magazine. Prizes will be awarded during a reception on Thursday, April 27, 2017. University winners will be recognized at 7:30 p.m. at The Candy Factory, 342 North Queen Street (rear), Lancaster. This contest is one of many cultural events that LACC offers to promote and maintain the rich Latin American heritage and culture of South Central PA.